England head coach Stuart Lancaster says it was his players' decision not to kick a late penalty for goal as they lost 28-25 to Wales at Twickenham. Trailing by three points with two minutes left, England went to the corner in an attempt to win instead of kick three points from a tight angle. "On the field it's the players making the decisions and it was a big call to go for the corner," said Lancaster. "The call came down to myself," said captain Chris Robshaw. "We wanted to go for a win - unfortunately it didn't come off. "It hurts like hell at the moment and we feel we have let a lot of people down when we were in a prominent position." England led 19-9 early in the second half thanks to Jonny May's score, but Gareth Davies crossed with less than 10 minutes remaining before Dan Bigger landed a penalty from long range to send Wales top of Pool A.
Lancaster's side gave away 12 penalties during the 80 minutes, seven of which Biggar successfully kicked to take his tally to 23 points. 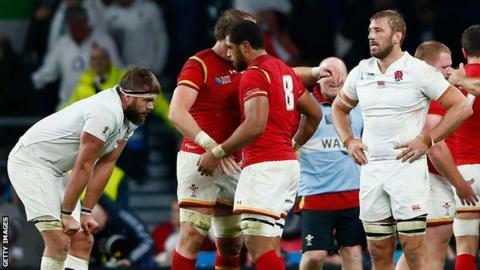 "I'm so frustrated to have allowed Wales back into the game in the way we did," said Lancaster. "We've talked a lot about discipline and breakdown penalties, and we gave some dumb ones away which kept them in the game. "We were going well but ill-discipline from us and Dan Biggar's great goal-kicking kept them in the game, and from there they got the try and suddenly it was 28-25." "Arguably Wales' biggest and best win on foreign soil"
Former England scrum-half Matt Dawson: "It is a combination of individual skills and individual decision-making on the pitch. That has let England down. At the minimum, after a bad day at the office, you come away with a result. "It was mystifying, as was the indiscipline. I'll never forget this game because very rarely do you see such spirit in adversity away from home. This is a massive, if not Wales' biggest ever, win." Ex-Wales scrum-half Rob Jones: "I am absolutely delighted. For 50 minutes, Wales weren't in the game and their set-piece wasn't functioning. Then we had the injuries. But they found the energy and that bit of belief and confidence. The momentum came and that was a remarkable finish." Former England fly-half Paul Grayson: "England have only got themselves to blame. They had that game under control. Their destiny was in their hands but they gave away cheap points and handed the initiative back to Wales. England created the scenario where a try would win it for Wales."